CH555 Monarch Executive Drafting Chairs. Designed for the ultimate seating comfort. 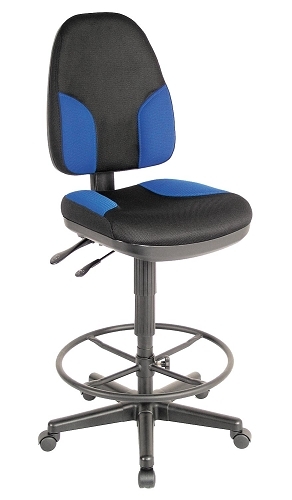 Ergonomic features that provide lumbar support, include a contoured 2 1/2" padded backrest that adjusts forward and back and higher or lower; 19" x 17" seat cushion. Optional armrests available. The “Monarch” has a two-lever adjustment system. One lever adjusts the seat and back to tilt forward or back with ease. The other lever is a pneumatic fingertip adjustment that raises the chair from 25" to 30". Includes 22" diameter footring that can be adjusted to the desired height and then locked into position. Rugged 5-star black base for stability. 5 hooded dual casters for easy mobility. Styling, comfort and construction make the Monarch chair an outstanding value. 205 points will be rewarded when you are logged in to your account and buy this item.